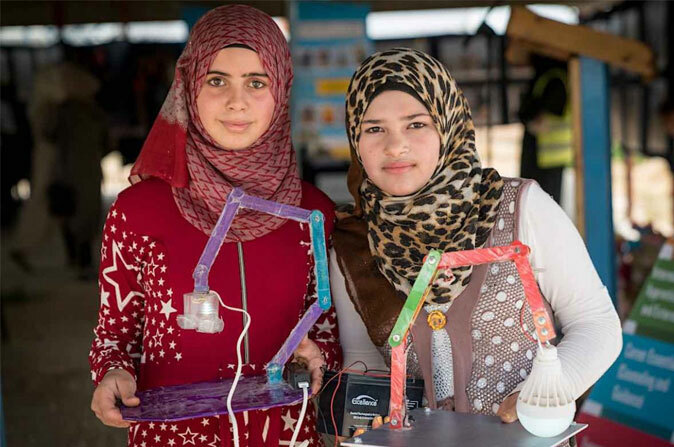 Syrian girls show reading lamps made from recylced materials. Confronting the hard reality of endless war at home, Syrian refugees in Jordan live in a kind of limbo that requires taking matters into their own hands. Though technically against UN regulation, informal trade in Zaatari, the world’s largest Syrian refugee camp, has flourished. Shops offering bicycle modifications, pet canaries, wedding dresses and hand-made wood furniture now produce an internalized economy worth $14 million a month, as well as the most priceless of things, restored dignity. Turning a blind eye to unregulated commerce in Zaatari has also revealed a ripe entrepreneurial spirit. Armed with the intent to nurture this, as well as an understanding that refugees come from all educational backgrounds, UNICEF and Chinese NGO One Foundation jointly conducted “Start-Up Zaatari” last May, an event that featured workshops on fashion design, creative brainstorming, artificial intelligence and robotics. One former Zaatari resident was reported as saying that the program is exactly what displaced youth yearns for. “They particularly need this support to help them cope and learn the skills needed to rebuild Syria,” Muzoon, a UNICEF goodwill ambassador, told the Jordan Times. Muzoon is one of 657,000 UN-registered Syrian refugees in Jordan, though there are at least 1.3 million in total residing in the country today. Zaatari’s 80,000 camp is thus just a fragment of this population, but its residents also are among the youngest and most vulnerable; 60% of the camp population is under 25. Events like “Start-Up Zaatari” give these youth an outlet to explore their talent and potential, and the events are increasingly part of life in more permanently settled camps. The UN has previously organized “Social Innovation Labs” at Azraq, Jordan’s second largest refugee camp, as well as Zaatari, which began in 2016. The labs unite young refugees to brainstorm how to solve common problems in their community, followed up by the creation of prototypes and inventions. “To date, inventions have included solar-powered phone chargers, water distilleries, reading lamps made from recycled materials, a gas-powered oven, winter rugs, an ice box and a medicine cooler made of recycled materials and two types of washing machines,” the website of UNICEF USA reports. Taking into account this expected long-term stay of Syrians in Jordan, programs like “Start-Up Zaatari” and “Social Innovation Labs” make sense. Afterall, losing hope for the future may be the most incidious enemy of all.